Your kids will definitely not be able to resist these! Milk is one of the best sources of calcium, vitamins and minerals, especially for growing kids. As a mommy, you want your little one to drink milk regularly, but sometimes, it can be challenging for him to sit down and finish a full glass. Kids love chocolate, so it would be the perfect opportunity for you to serve a nice warm cup in the morning or a refreshing ice cold glass in the afternoon. Flavored milk like BEAR BRAND Choco Milk Drink is different from other powdered chocolate drinks because it still has the same amount of nutrition as non-flavored milk. You can also turn BEAR BRAND Choco Milk Drink into a nice mug of hot chocolate, perfect for breakfast. BEAR BRAND Choco Milk Drink has the same amount of Tibay-resistensya nutrients like Iron, Zinc and Vitamin C, found in BEAR BRAND Powdered Milk Drink, making it the perfect alternative for kids that are "milk lapsers", or those who have a hard time drinking their milk. Besides serving it as a great complement for a hearty breakfast, you can also turn milk into delicious snacks like polvoron. Just toast a cup of flour over medium heat. Once slightly browned, transfer to a bowl and add half a cup of butter, half a cup of sugar and half a cup of powdered milk and mix until well incorporated. Use polvoron moulds to shape the milk mixture, arrange them on a cute plate or wrap them up in colorful packaging and serve as a delicious morning treat! Pairing milk with cookies for your child's afternoon snack works because it seems like a treat. From spaghetti to pizza to hotdogs, when you connect eating your child's favorite snacks with drinking milk, he'll be more likely to finish it too. Try out some of these simple tricks to get your kids to keep enjoying milk. Got some ideas on how to make milk more interesting? Share them here! 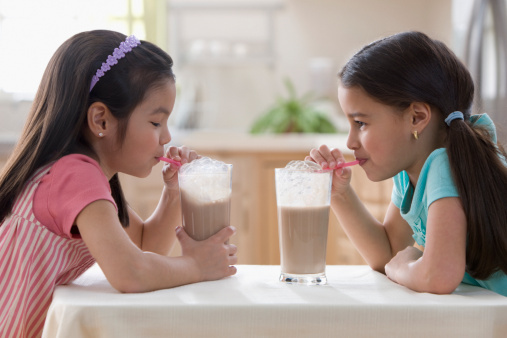 This article was created by Summit StoryLabs in partnership with Bear Brand Choco Milk Drink.